Green cabbage, potatoes, chicken cutlets, 6-pack Coca-Cola of 16.9 oz. 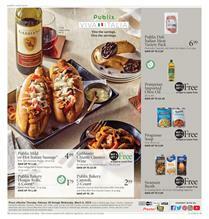 are just a few of the products from the latest Publix Weekly Ad. Get a $10 off with the purchase of one $50 gas card. Greenwise organic foods are great options for customers looking for healthy foods. Organic pizza, Italian chicken sausage, Angus chuck roast, organic baby-cut carrots, a2 milk, and more are available on sale. Recipe of salmon-sausage coddle is readable on pg 3. Browse the deals on Publix premium mussels, Lean ground beef, and the ideas for lunch or dinner. 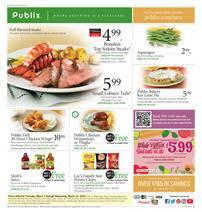 Publix is doing a great job in preparing delicious lists of foods in all weekly ads. If you are indecisive about what to eat on a daily basis, I'd recommend you to read a Publix Ad even for getting an idea. Cooking is great but sometimes we lack time and skill. Some ready and quick meals can help you a lot to save time. Deli food is also a great choice in most cases. Meat is an important department of the new ad. 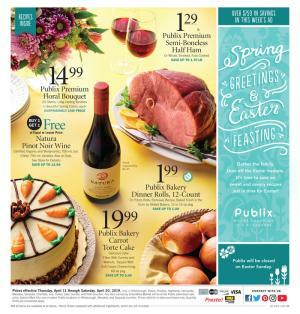 Publix Weekly Ad offers GreenWise bone-in Angus ribeye steaks for only $11.99/lb. Organic quinoa, perdue whole chicken, Sirloin top roast, and more are available on pg 5. Also, celebrate St. Patrick's Day having the foods from Publix. Subscribe to the newsletter and get the future deals in your inbox. Murphy & David's or Grobbel's Corned Beef Brisket $3.99 lb. Follow our Facebook page to get these posts on your feed. If you like them, perhaps you can like other categories and supermarkets that operate in your area. Check out all the other markets to see if anything is suitable for your taste. Find great food in Publix Ad again. Steak, lobster, key lime pie, chicken drumsticks, chicken wings, Mott's juice, and more products are examples from the ad. They are available on the first page of the ad. You can buy snacks like Coca-Cola packs, Oreo cookies, Monster energy drink, Nabisco Ritz crackers, Powerade sports drink, and more are available on pg 2. Read the recipe of chicken Tortilla Soup on pg 3. Buy great meals at Publix for lower prices. Top round London broil, Margaritaville appetizers, shrimp are on sale. Check out the pantry-grocery category of the Ad to see these items. Aprons Thai beef meal kit is a great example. Pay only $21.99 for that meal kit. La Banderita flour tortillas will be BOGO Free deal. Seasonal goods from fresh produce is a great deal, too. Publix salad blend will be 2 for $5! Shop Florida celery, Publix red or Idaho russet potatoes in the fresh range. Hothouse cucumber will cost $5 for 3. Deli-bakery shelf of Publix offers quick and delicious food. Cheese variety, sandwiches, chicken meal, and more are available in the deli. Also, don't miss out the deals on GreenWise organic foods. Visit pg 10 to see chicken thighs, organic honey, organic ice cream, and more. Subscribe to Publix Ad or follow our Facebook page to get notifications about these posts. It's updated whenever a new ad is available. Coffee, fruit juice, sauce, pantry products, simple meals, snacks, cookies, beverage packs are all BOGO Free at Publix stores! 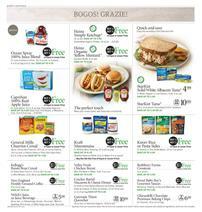 BOGOs of Publix are available on pg 10-12. A variety of products from many different categories are in the list of BOGO free items. Get the second of Jell-O instant pudding or gelatin dessert, Hunt's or Rotel tomatoes, and more items for free! Also, see the multiple-buy deals like Juicy Juice 100% juice blend. Get 3 of that for $6 only! Save $6.99 on Gatorade thirst quencher! Another great saving is $4.49 on Cascadian farm organic cereal! 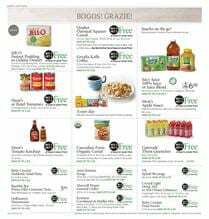 Summer snacks like ice cream and frozen meals including Gorton's fish fillets, Smartmade or Devour entrees, Siggi's Icelandic style skyr might also be interesting BOGO Free deals from the latest Publix Ad. You can really simplify everything about dinner and lunch with these quick food solutions. Besides, BOGO Free range is a great sale covering favorite snacks and sweets. One of the most popular products from the range of Publix is Nabisco wheat thins which will be 2 for $5 this week.